Offshore deepwater drilling operations normally require pressure testing of the auxiliary lines while running riser. Failure to test the riser while it is being deployed can lead to pulling it back and incurring excessive non-productive time that could have otherwise been avoided. 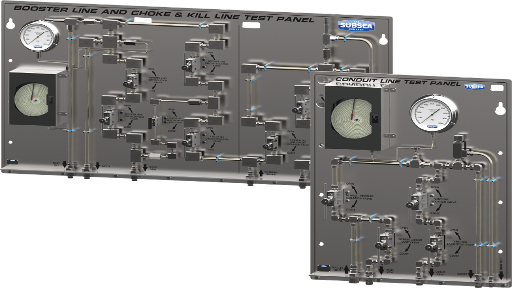 The test panels control the flow of BOP fluid into the lines being tested and the integrated mechanical chart recorder documents the successful pressure test. After each test, the pressure is released through the vent function on the test panel. This frequent testing requires reliable valves and plumbing that can be easily serviced and replaced when the inevitable wash out from high velocity turbulent flow compromises system integrity. The Subsea Company design makes it easy to replace worn components and fittings minimizing down time caused by this severe service. The panels use valves sized to allow for quick testing and the integral relief valves protect from over pressure.